Barry Silverstein is a Boomer, freelance writer and retired direct marketing/brand marketing professional. He is the author of numerous non-fiction marketing and small business books, including Branding 123 and The Breakaway Brand. He also writes a blog for Boomers called “Happily Rewired.” Silverstein resides with his wife in the Asheville, North Carolina area. For a delightful look at the products and mores that shaped the lives of the boomer generation, you can't do much better than Boomer Brands by Barry Silverstein. For those of us who grew up in the fifties and sixties, these were the things that "tunneled their way into your consciousness when you were a kid." There are over a dozen chapters, each dealing with a different facet of the boomer experience. View Tube explores the wonders of television. Bowled Over examines our love of breakfast cereals. Reelin' and Rockin' deals, not surprisingly, with the music that shaped a generation. Each chapter presents a brief background of the subject, followed by spotlights shone on "Cameo" brands the author chose to describe in further detail. Boomer Brands is a quick read, and Barry Silverstein provides some marvelous anecdotes concerning his subject matter. Each chapter contains online references to those inspired or interested enough to search out further information. Because, let's face it, the book can't cover everything. Entire volumes have been written concerning Barbie dolls, which receive only a brief mention here. And considering the current interest in superhero movies – a sure sign that my brothers and I weren't the only comic book fanatics out there in the 60's – I was surprised this medium received barely a mention, and then was grouped with toys and games. And no mention of the Jonny Quest cartoons seems a slight that cries out to be corrected. But these are minor issues, and anyone searching for fault can find them. So don't look. Just savor what you find here. 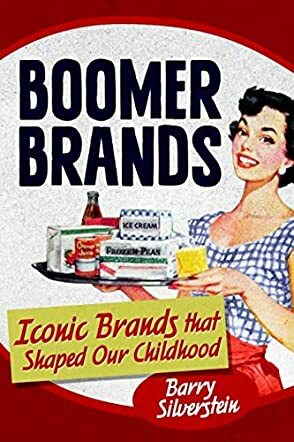 If you're looking for some pleasant nostalgia, a fond look at a simpler time, and a good book to curl up with for a few hours, then you've found just that in Boomer Brands. I highly recommend it.